Credentials are like a box of chocolates: you never know what you are going to get! There is growing confusion in the marketplace over the number and type of credentials entering the market. What do they mean, and how can one tell the wheat from the chaff? In this article, Roy Swift, PhD, executive director of Workcred discusses industry-based credentials and hallmarks of quality, which is key to advancing the workforce and improving the overall performance of the labor market. The number and variety of credentials have increased significantly in recent years, leaving stakeholders understandably confused about whether a credential has quality and market value, or if it is a "credential to nowhere." But with less than ten percent of the more than 4,000 personnel credentialing bodies active in the U.S. accredited by a third party, there is no common definition of quality or market value, varying levels of confidence, and little consistency across industry sectors. Like a box of assorted chocolates, you never know what you are going to get! With all this confusion in the marketplace, it has become difficult to distinguish wheat from the chaff. Job seekers and workers struggle to identify credentials that will help them find employment or advance their career. Employers are unsure what competencies a credential holder has, how it relates to other credentials, and if the claims can be trusted. Certifications are generally created for high-stakes examinations in areas such as health, safety, and finance where attainment of a certification is often required in order to obtain a specific job or position. 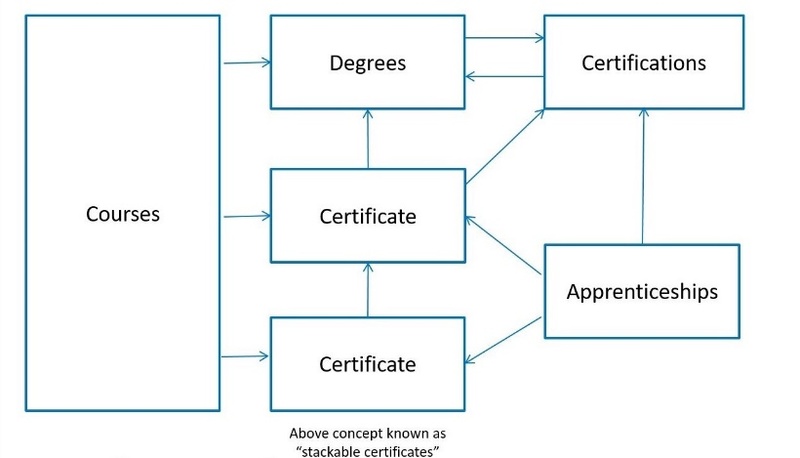 Certifications are based on a scientific study of the job or practice, and an examination is used as a third-party, independent judgment that the individual has the competencies required. Notably, certifications are time limited and include recertification. Procedures are also in place to revoke the certification for incompetence or unethical behavior. Certificates, on the other hand, are generally associated with training or educational courses, and are "good for life," meaning they carry no time limit or renewal requirement. An exam at the end of the training or educational course measures the knowledge and skills learned, but a certificate cannot be revoked for reasons of incompetence or unethical behavior. The absence of credible third-party assessments ensuring the quality of the certificate or certification program creates a "buyer beware" environment. Some educational certificates are housed in accredited institutions, but the specific program has not been reviewed to determine whether the certificates are ensuring a fair, valid, and impartial program that qualifies skilled workers. As for certifications, few are accredited by a third party using a national or international standard. The quality of certifications may be the biggest factor impacting the assurance that a worker who holds a certification actually has the competencies needed by industry. Too often, examinations are developed without job analyses validated by an appropriate sampling of the industry. What stands behind a credential – how it is developed and maintained – is critical to its quality, market value, and effectiveness. 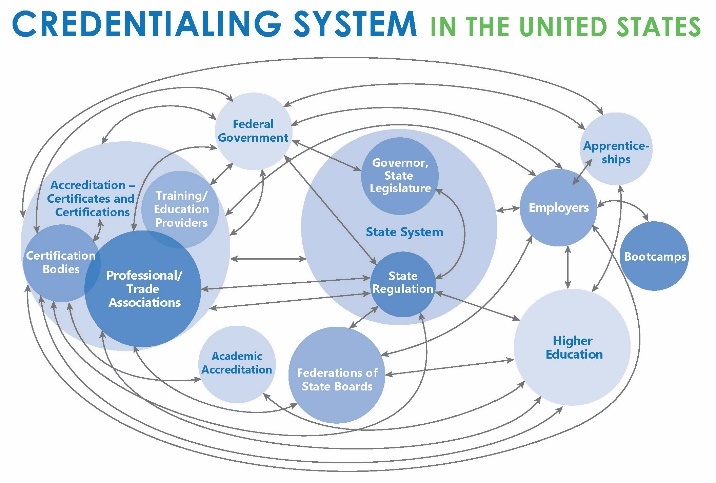 Rigor and adherence to best credentialing practices are the foundation of well-developed credentialing programs. Nationally- and internationally- accepted standards exist to ensure the quality of certificate and certification programs. ANSI/ASTM E2659, Standard Practice for Certificate Programs, is the globally-recognized American National Standard for certificate programs. ANSI/ISO/IEC: 17024:2012, Conformity assessment – General requirements for bodies operating certification of person, is a national and international standard that sets the bar for quality certification programs. As workers cross borders, it’s important to have consistency around the globe on the value of high-quality credentials. Accreditation to these standards by an organization such as the American National Standards Institute (ANSI) provides a neutral, third-party attestation that a given certificate or certification program meets globally-accepted benchmarks, increasing the integrity and mobility of the credential holders. A founding member of the International Accreditation Forum (IAF), ANSI's accreditation process complies with the international standard for quality accreditation practice, ISO/IEC 17011, which is the basis for mutual recognition of accreditation bodies around the world. This assures that credentials – just like products – are transportable across borders, broadening the global labor market and opportunities for employers and employees. Workforce development is a shifting landscape that needs an ongoing, systematic approach. Formed in 2014 as an ANSI affiliate, Workcred's mission is to strengthen workforce quality by improving the credentialing system, ensuring its ongoing relevance, and preparing employers, workers, educators, and governments to use it effectively. At Workcred, we are working with the business and credentialing communities, federal and state governments, educational institutions, and more to improve educational and certification outcomes and create better alignment between industry, education, and credentials. Focusing on quality will help move the needle on workforce development issues. It will raise the quality of the workforce and improve the effectiveness, efficiency, and overall performance of the labor market. Simply increasing the number of credentials in the United States is not the answer to our workforce issues. We need credentials that have credibility with industry, meet quality standards, and have provided evidence they are effective in the workplace. Too often, workers who hold credentials come to industry without the competencies as advertised. Standing up for quality is critical if we are going to maintain the credibility of credentials. Suggested Citation: Swift, R. Credentials are like a box of chocolates: you never know what you are going to get! Journal of Interprofessional Workforce Research and Development. Volume 1:Issue 1, 2018.